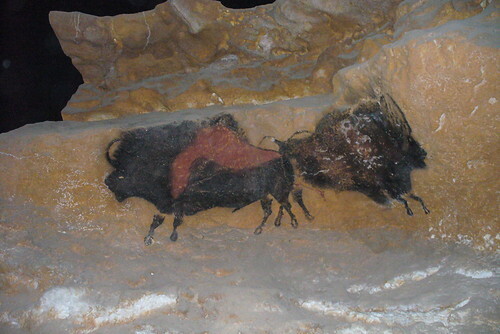 Lascaux cave painting. CC image courtesy of christophe brocas on Flickr. Last week I blogged about the difficulty of maintaining a balance of intrinsic versus instrumental benefits of the arts in the advocacy process. Many advocates feel that we do need that "proof in the pudding" when when we up against an educational system that values standardized tests above all. Others point out that this can be dangerous by potentially overselling (or cheapening) the cause. In this piece from the Washington Post's education blog, Valerie Strauss does an excellent job of getting to the heart of why many advocates bristle at the constant need for hard evidence that the arts are a strong positive force in the education system. Strauss says that to anyone who is paying attention, it is "self-evident" that art education is connected with achievement; she compares it to research from PE advocates connecting healthy athletic activity to improved academic performance. "As if helping kids stay physically healthy isn’t a good enough outcome on its own." Strauss' assertion that "the whole exercise belittles the importance of creativity as a value necessary to the development of young people." I think this really gets to the heart of why so many advocates steam when reports rely on research to state the obvious about the arts. As I work on completing my grantwriting internship for a fantastic and innovative community arts organization here in NYC, I can relate. Writing about how community and public art projects provide benefits to their intended communities can feel like a big exercise in stating the obvious. But there's another layer there too. Not to go all new-agey on you, but the arts really are the soul of humanity--they are way of expressing ourselves, which is a big part of what makes us human. Studying the caves at Lascaux isn't just important to find out how we lived thousands upon thousands of years ago. It's also a record of that human impulse to expressively communicate that connects us back to our Paleolithic ancestors. So prioritizing test scores over this very human need to create and express can make it feel like we are selling ourselves short in a way that PE or STEM advocates might not. I suppose that I'm stating the obvious to arts advocates, but sometimes the obvious is worth repeating--in advocacy and beyond! Hi Alison, great blog. Thanks for creating a forum to discuss such issues as arts advocacy. It is frustrating to try and explain why and how the arts are so integral to humanity and education because it really is a DUH kind of statement. It seems so obvious to many, but alien to others. Curriculum really is a "mind-altering device," and the arts are a great vehicle to help people discover new ways of thinking and reacting. A large part of the issue, from my point of view as a High School teacher, is that the system does not seem to value multiple forms of intelligence. Schools do not try hard enough to discover the individual strengths or potential intelligences that each person possesses. It is easier to aim for a uniform result. As a result, as the article mentioned in your post points out, 66% of High School Students were not exposed to the arts. Now the issue is that legislators lack the vocabulary to understand the arts because they themselves have never been exposed to its benefits. The more the listener can hear, the greater likelihood of understanding. We all know that the arts "plunge us into adventures of meaning," allow us to imagine new realms and break through boundaries of linear, logical thinking and go beyond the confines of a singular reality, but try explaining that to someone who has no experience in the arts. Good News for Arts Advocates!